Miss Mara, taking after her big sister. Thanks so much for your wonderful messages for Daisy ~ she’s responding really well to her treatment, and seems as strong and content as ever and happy to soak up all the love! I hold my coyote medicine necklace every morning and ask that Daisy might have a good day filled with love and healing; thank you SO much for the update on her! Great news. I hope she continues this way for a long time. Thank you for the update! Wonderful news! Prayers continue for Daisy! Good news is always welcome news. I pray that Daisy continues to improve. Love the picture of Mara. 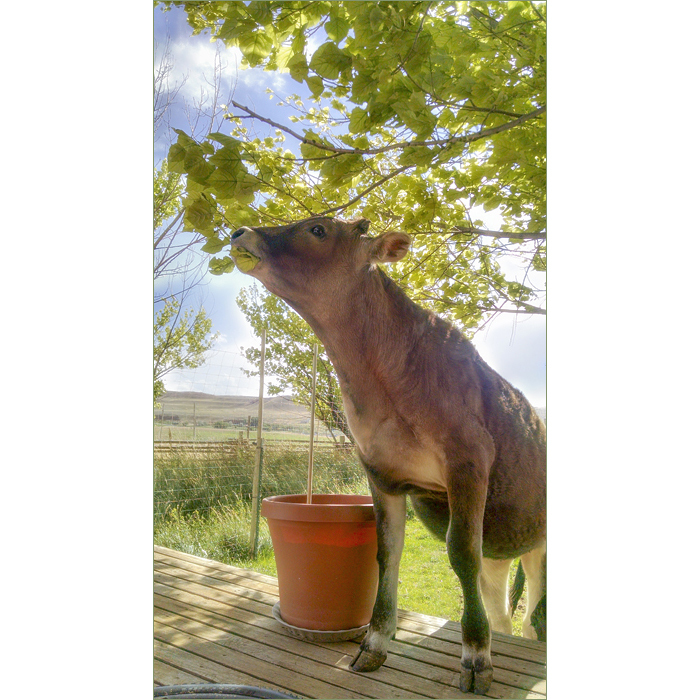 Miss Mara – you are a beauty – and very skilled at finding yummy leaves! so glad Daisy is responding well to treatment! So glad to hear good news about Daisy! Love the photo of Mara. What a pretty baby. Oooh what’s in the pot? A family quirk or are they learning this from each other? Who is the original Leaf Thief? Boy, she sure got big in 7 months. I’m so glad to hear that Daisy is doing well. I’ve been consoling myself by going back and reading the Daisy posts. I find Daisy on my mind often since your last post — thanks for the update! YEA!!!! It is thanks to your loving care that Daisy is doing so well. So glad to hear it. What a beauty! She looks like the deer in our yard going after sweet treats. (Often my kitchen garden). Happy about Daisy’s improvement. Reaching out with a little Reiki energy. Great news! May the Force be with Daisy. Holding her close in my heart. And you, Shreve. Such relief….good news…I am so very happy….Love this photo…. I’m sooo glad to hear Daisy is more than holding her own. I’ve been very concerned, so this update is most welcome! Thanks so much for letting us know. She (and you, too) will remain in my prayers! Sending hugs and love to all! I love Mara’s black accents. And so happy for Daisy’s good news! Hugs to all!